Most Oystercatchers stay by the coast but the fields around Trochry have recently been home to several of these easily recognised black & white birds with bright orange bills and distinctive call for many years. You'll be rewarded with a glimpse of them if you walk the lanes. 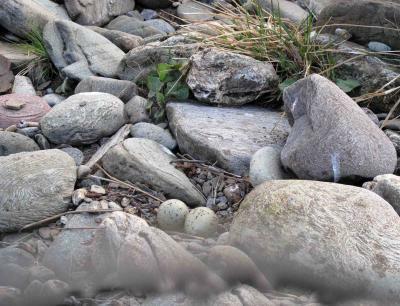 One guest down on the riverbank came much closer by accident, seeing a nest camouflaged in the stones - which he wisely left very quickly after taking a very quick photo to share.